Last post I showed you some photos of Craft Alive the show we attended a few weeks ago. If you missed that post with some of the highlights then head back a post. Today I want to show you some little treats I created. First off I made these little Easel calendars for the 3 other ladies on our show team. I invited each of them on this crazy ride with me and wanted to give them a gift. I made this for their little gift pack to say Thank You to them. These were so easy to make. Without giving you specific measurements I will tell you how they are made so they can work for metric or imperial measurements. Take a sheet of card and cut it in half vertically. Put one half aside. With the other length you have, score the piece in half. Then score one of the sections in half again. Then fold on the score lines. Fold it firstly in at the half way line, then fold the other score line inwards. The larger section is the base part. The smaller equal sections are folded. Does that make sense? You will also need an additional card piece that can be adhered on to the front. This piece is the same width as the card and you can make it any height. I made it the same height as the base length. In other words, the other piece of cardstock you put aside at the beginning, cut that in half and it will be the right length. I hope that all makes sense. Really it is the idea of it. The actual measurements are entirely up to you. Decorate as you like. I had pieces of the Share What You Love Specialty Designer Series Paper that I decorated the front with and a butterfly from the Butterfly Gala stamp set. I also needed to make some tags up for the prize gifts. Stampin’ Up! were very generous in donating a box full of retired products. We made up so many prize packs and gave away several per day. I have one of each colour of the tags I made using the lovely Gingham Gala Designer Series Paper and the Amazing Life stamp set. I hope you like these. I think everyone who received one loved the tag…. or maybe it was all the lovely Stampin’ Up! products they received. They were very excited anyway. Last night I had my Online Christmas in July class. You might have seen it advertised. I thought I would show you the projects. I won’t normally do that but I thought since I am celebrating Christmas in July this month – why not!! In both projects I used the Star of Light stamp set and the Starlight Thinlits. This first project is a Christmas Hanger that you could maybe hang from a window or in the house somewhere, even in the tree! I have the photos and I have added a video further below. Go and check it out! Here are a few close-ups for you to see. This is the back of the sentiment. It’s good to have things on the back for when it spins around. Just to show you how I attached the ribbon. I added some Fast Fuse Adhesive to the back of the star. Then looped over some Gold Taffeta Ribbon and stuck that down to it. Add the Fast Fuse to the back of each star. You can loop around some Gold Thread and stick that down too. If you would like to see this more close-up check the video out. I think some different colour variations are in order. I will post the other project tomorrow. MINI NOTE CARDS WITH HIGH TIDE! I held a workshop last week and the Host asked to use the High Tide set. As a Thank You to her I made up a little notecard set and put them all together in a box made with the Wood Crate Framelits. Here they are for you to see. For the sentiment on the crate I went over the “shine” word with the markers and stamped on white card. I did have to go over it a little with the markers when I stamped it to get a clear impression. Here are the cards for you to see each one. The cards measure 7.5cm x 7.5cm (3″x3″). I made them all different. The set is so versatile and so many combinations you can create. I hadn’t played with this set that much until I made these. This is the Make and Take card we made. This is Cased from Julie Davison HERE. Don’t forget if you don’t want to miss any projects I am sharing on my blog here be sure to subscribe. Click on the box in the right hand column to get my updates sent straight to your inbox. 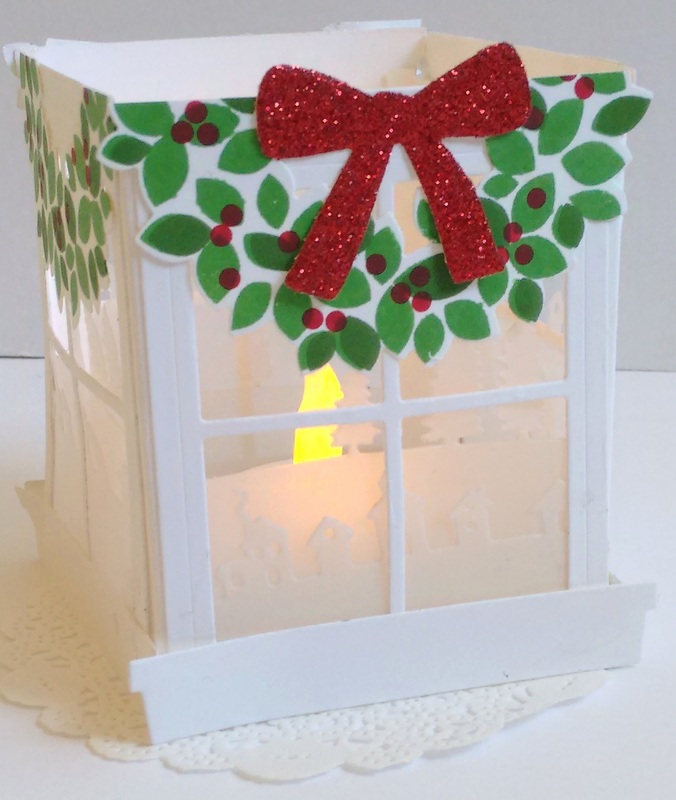 3D projects, cards, Christmas, Stampin' Up! STAMPIN’ UP! CHRISTMAS GIFT CARDS! How is the Christmas shopping going? Are you stuck for ideas for some special people OR are others unsure what to get you?? Maybe a Stampin’ Up! Gift Card is the answer. Saves joining in the crazy Christmas traffic and the crowds. Here they are nicely decorated and ready to go for you. Just choose the amount. 3D projects, Catalogues, Christmas, Stampin' Up! A couple of weeks ago with my order I got the new ‘Sweet Home’ stamp set and the matching Thinlits. I finally had a play recently and made a cute little house. I thought I would show you. These ‘Home Sweet Home’ Thinlits have so many special little “bits”, OK well dies to be more technical – 22 in fact. You can create so many variations. I will say this did take some time but I think now I have made one I can whip them up pretty quickly. I think the most time consuming part was the roof. Also, I found it a little tricky lining up the stripes on the walls of the house. This house was CASED from Pinterest but I added the circle wreath on the door using one of the dies and then punched some small red circles from the 2-step Owl punch for the “berries”. In the photo above it doesn’t really give you much idea of the size. I thought I would take another photo for comparison. Check out the size against an ink refill. Isn’t it the cutest?? I can’t wait to have some more play with these. Have a wonderful day/night wherever you are in the world. Can you believe it is Easter in a few days? I have been busy making some Easter Treat Baskets. Some were for my Easter class last week but I also have an Easter Night Markets tomorrow so I have been getting ready for them too. I thought I would show you some of the projects. Here are some of the baskets I have made. The Bermuda Bay and Melon Mambo baskets wereone we did at my Easter Class last week.We made them in the Bermuda Bay. This is made with the Envelope Punch Board. There are a number of similar tutorials on the internet but the one I used for this basket was by Deb Valder and you can find that HERE. I stamped the ‘Easter Lamb’ on Sahara Sand and cut it with a Circle Framelit. Then I coloured the fleece with the white Gel Pen. I saw this idea on Pinterest which I thought was very clever. The greeting is from ‘Teeny Tiny Sentiments’ and I added a flower punched in Daffodil Delight using the ‘Itty Bitty Accents’ Punch pack. I added a mini butterfly punched with the ‘Bitty Butterfly’ Punch too to finish it off. These little bags are called Bag in a Box baskets by Sam on Pootles. You can find the Youtube video to make these HERE. I used some retired Designer Series Paper. The little flower basket image is from the set ‘Sprinkles of Life‘ which is the Ronald McDonald House Charities stamp set. I stamped the basket on Daffodil Delight and hand cut that out. I stamped the flowers and punched this out with the punch. Then they were coloured with the Stampin’ Write Markers. The sentiment was stamped on Tempting Turquoise and punched with the Word Window Punch. I tied it up with some Retired Daffodil Delight ribbon.